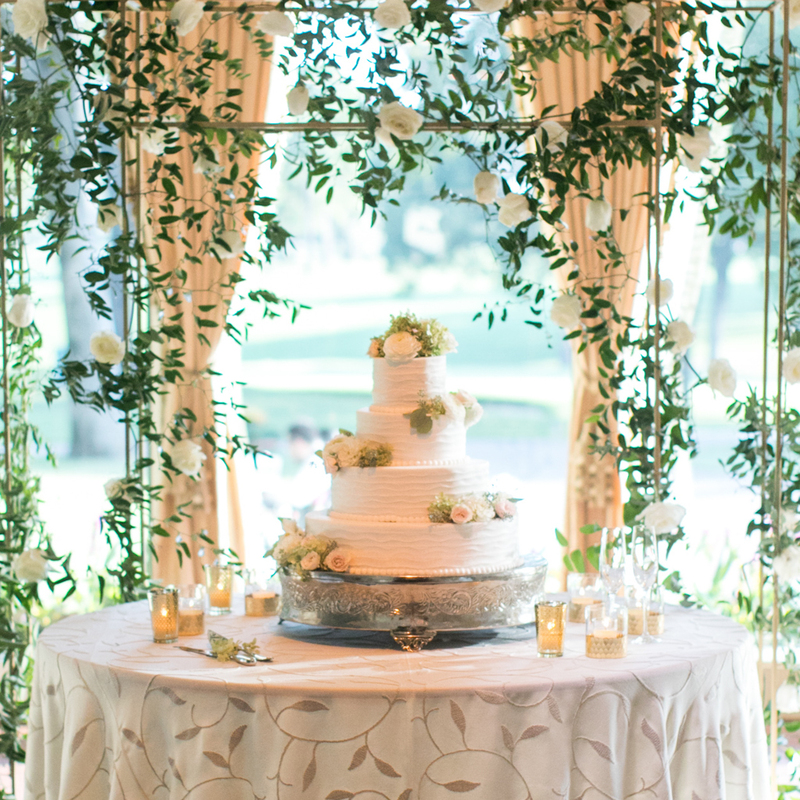 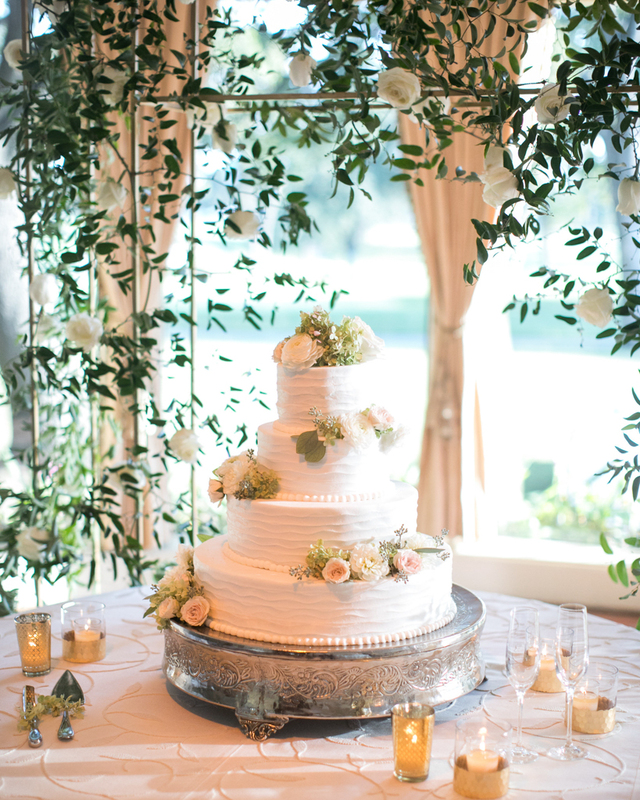 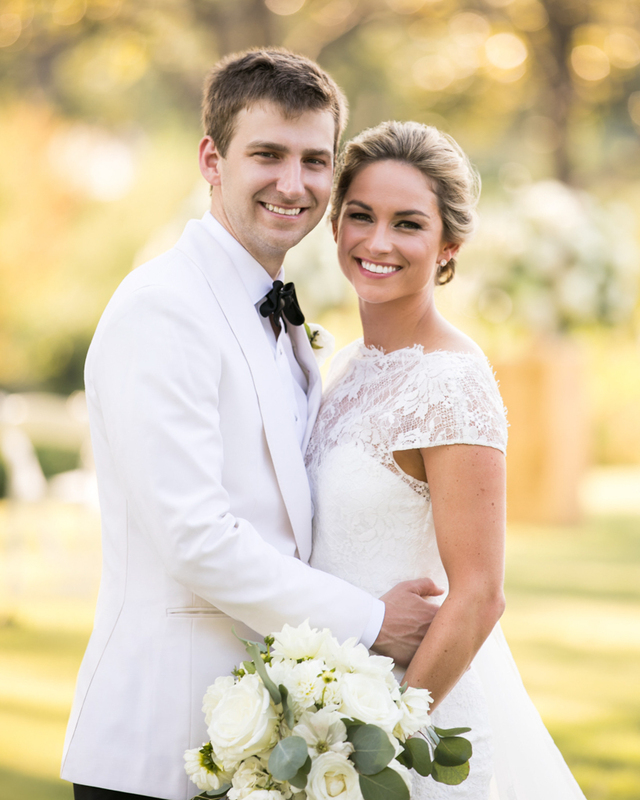 When inviting loved ones to their elegant Houston nuptials at the Lakeside Country Club, Maggie and Gray sent sophisticated invitation suites that foreshadowed the garden-inspired décor to come with a watercolor design on the envelope liner that would be repeated throughout the stationery for the rest of the fête. 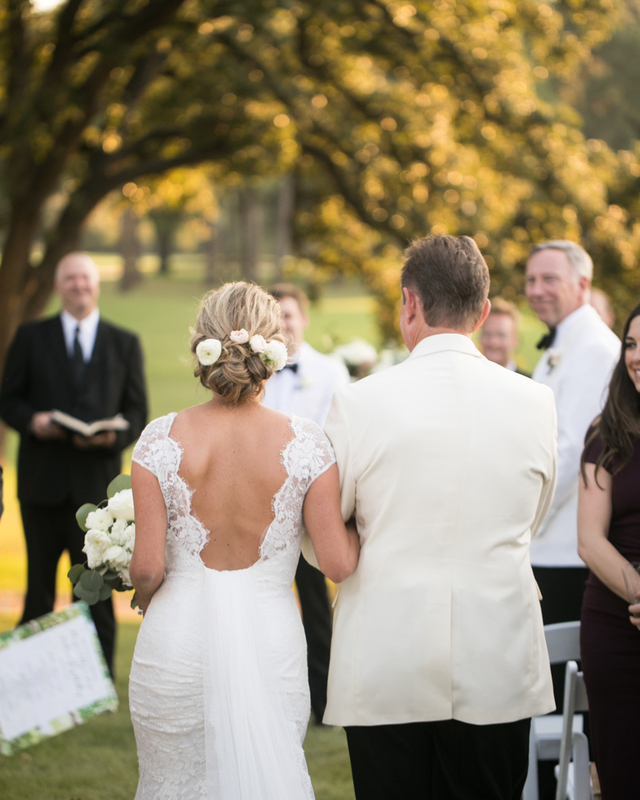 As guests found their seats on the lawn for the alfresco ceremony, they received programs that doubled as fans featuring the same artistic motif seen on the invitation. 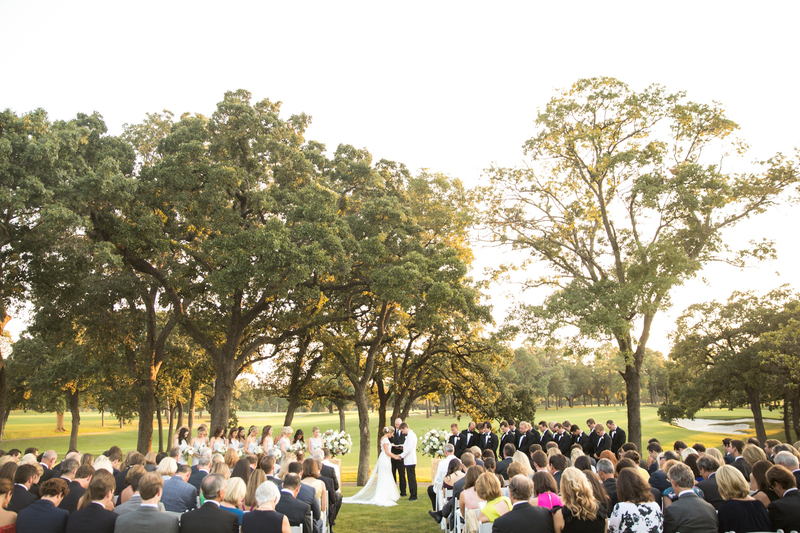 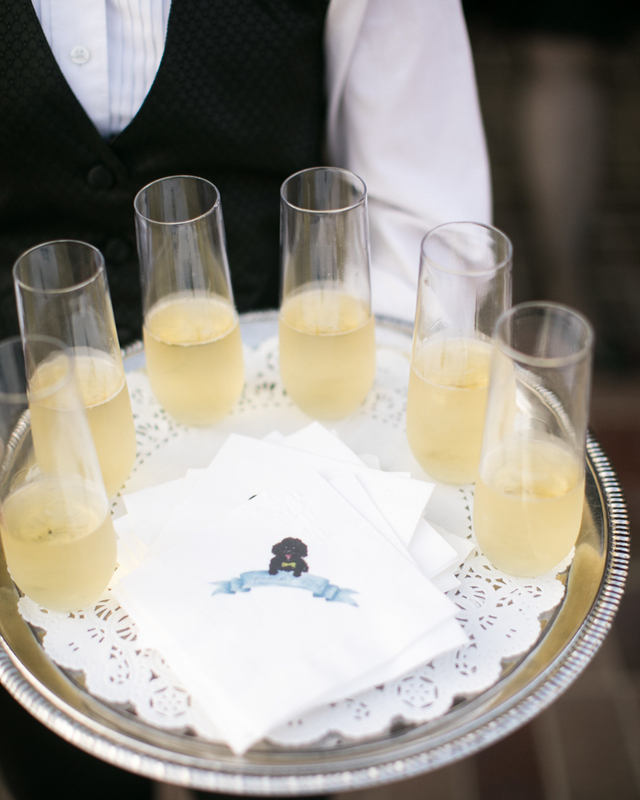 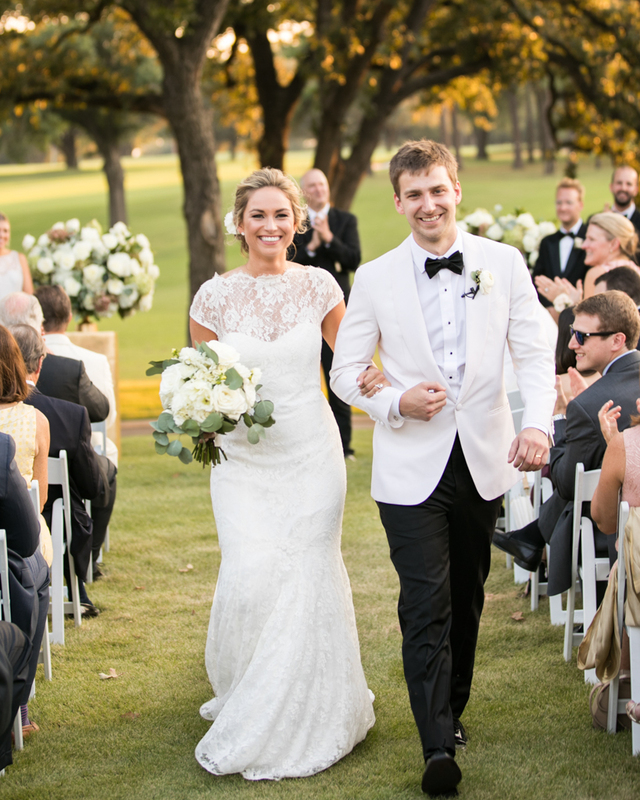 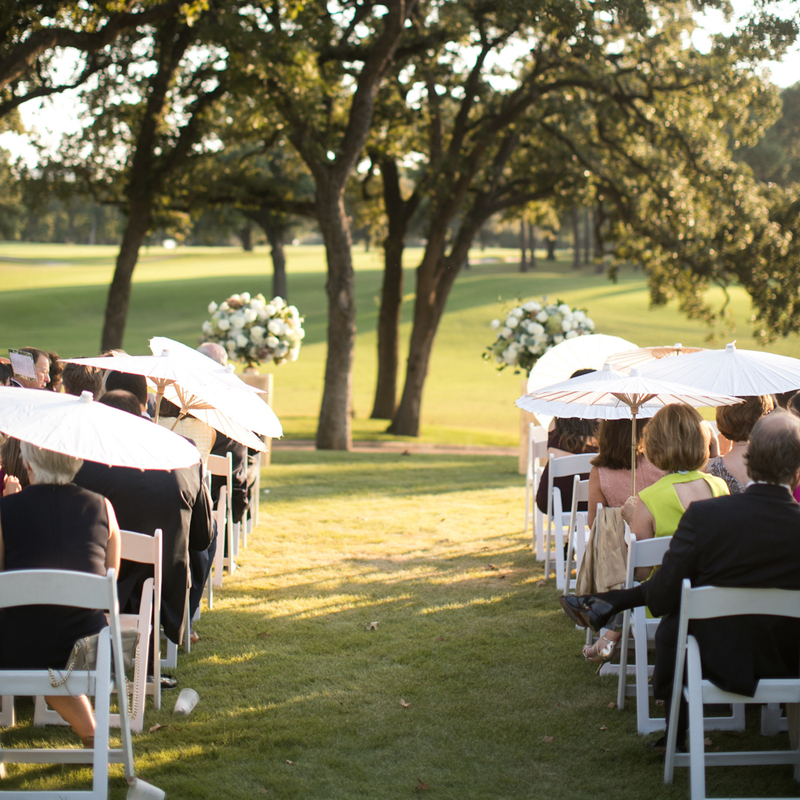 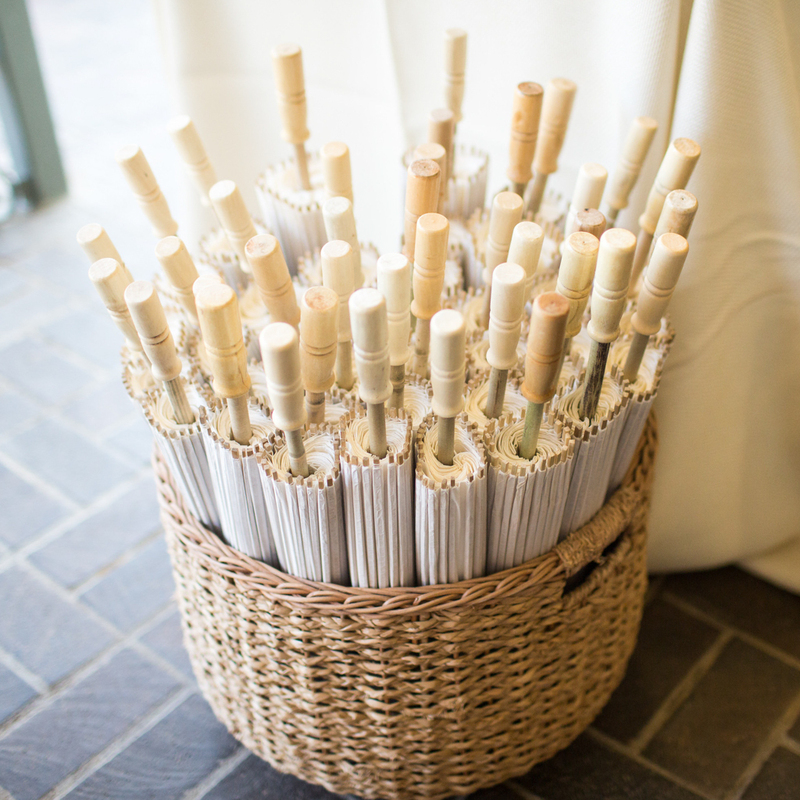 Parasols were also offered to keep attendees cool throughout the September vow exchange. 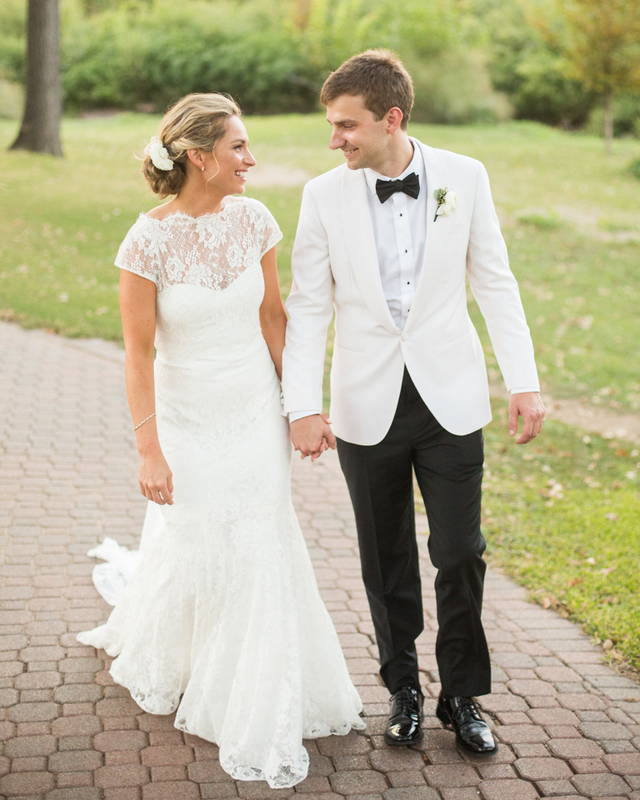 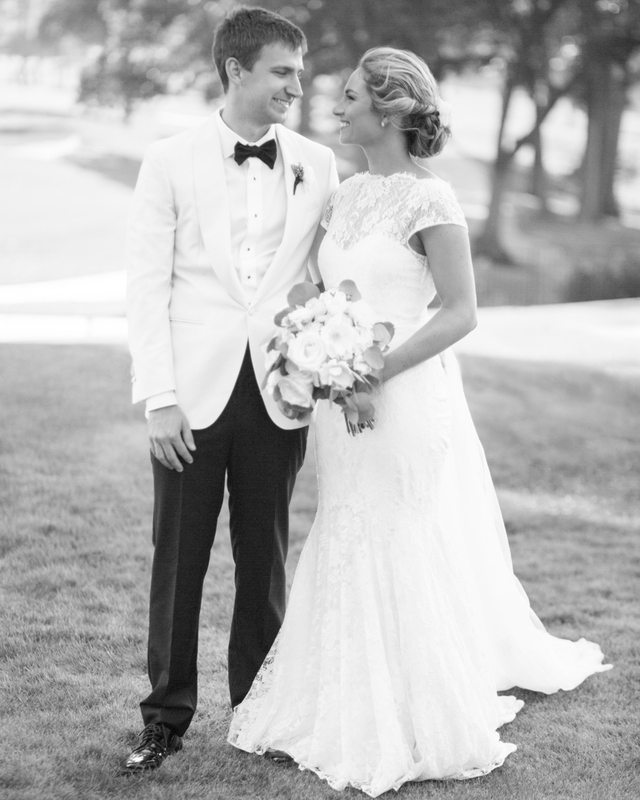 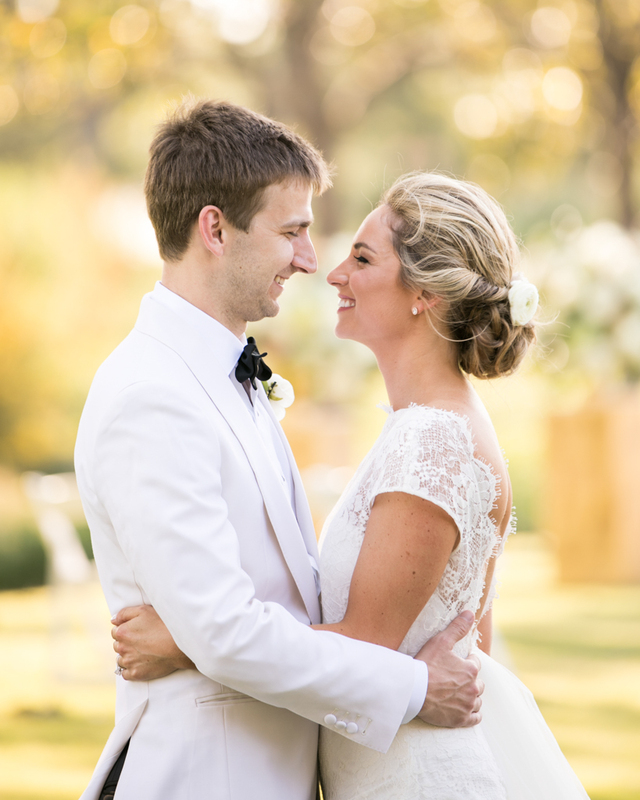 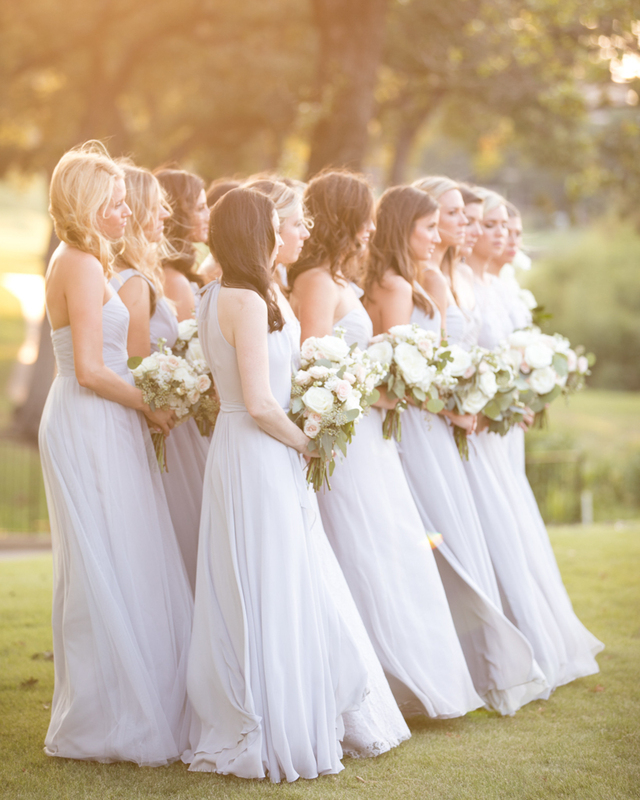 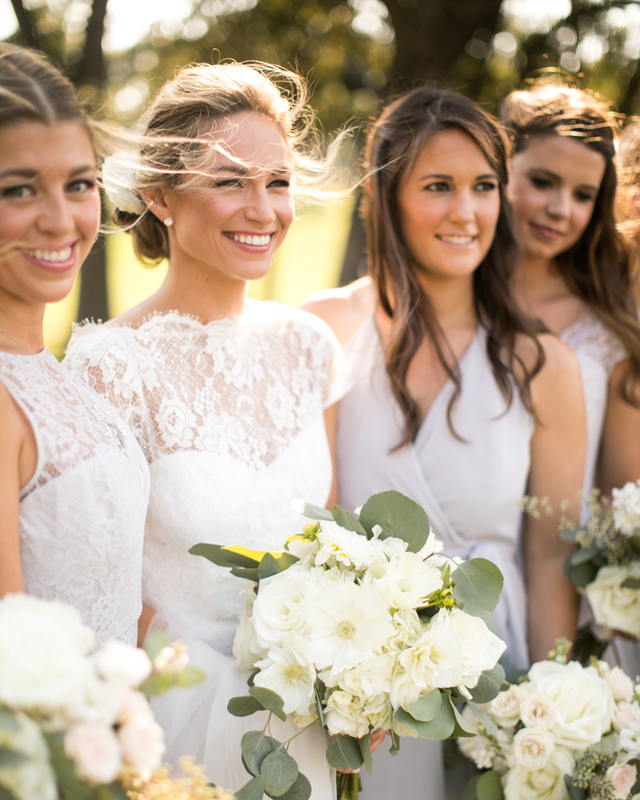 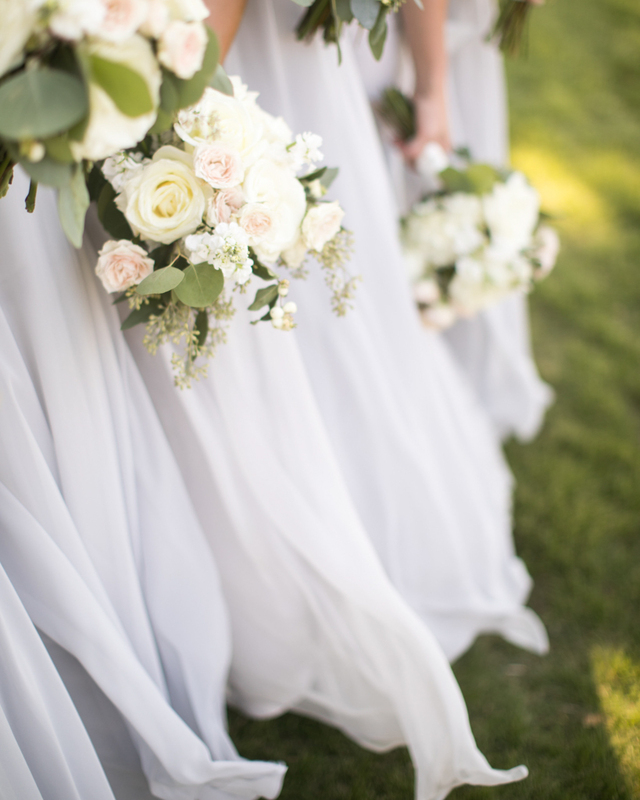 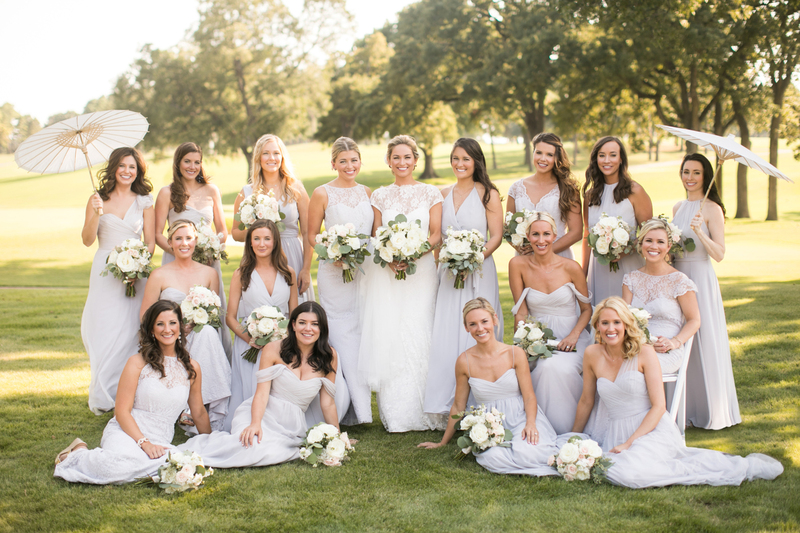 A string quartet played romantic melodies as the bride made her way to her groom wearing a stunning lace gown; her hair was worn in a low bun embellished with fresh blossoms. 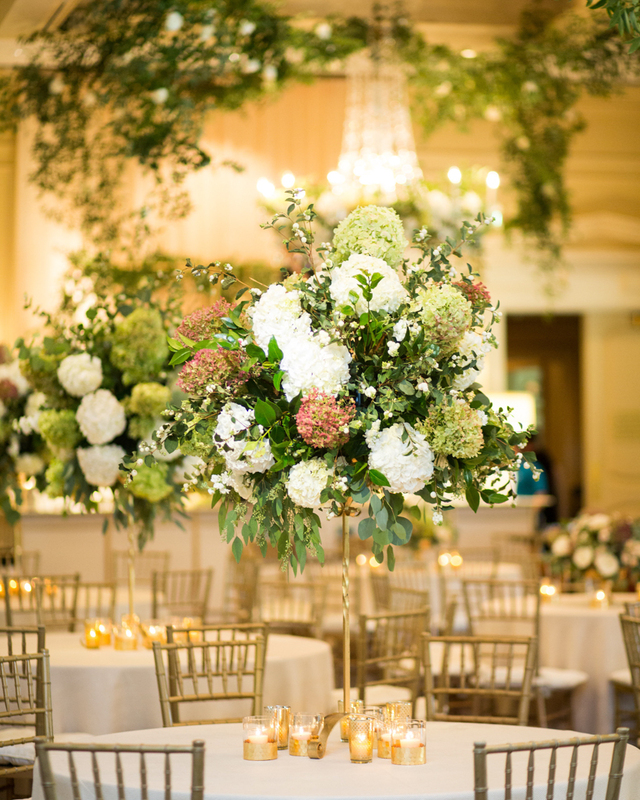 The pair exchanged vows between two lush arrangements of roses and hydrangeas in autumnal hues on gold stands. 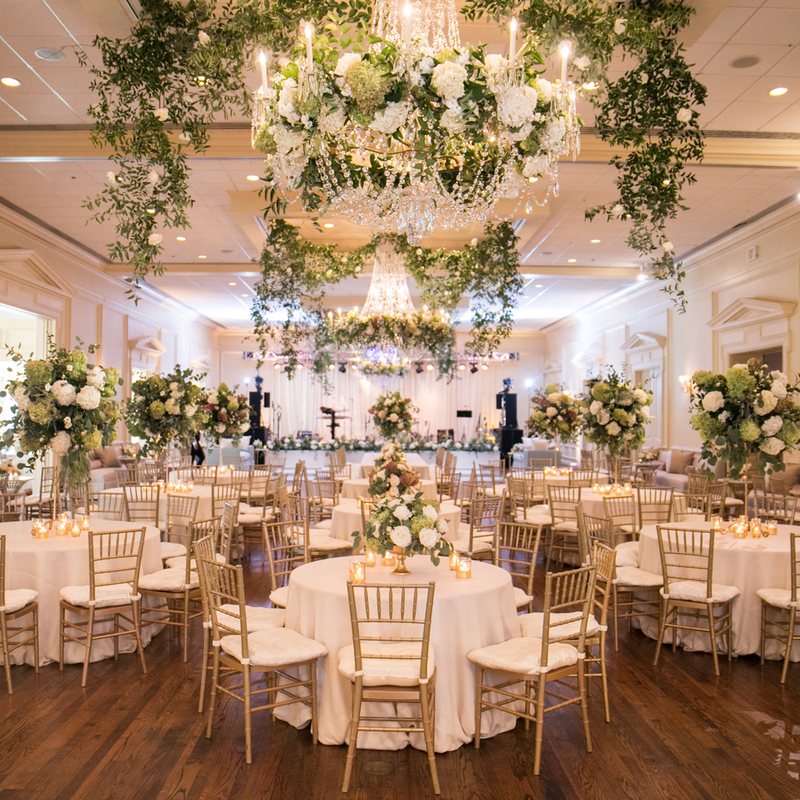 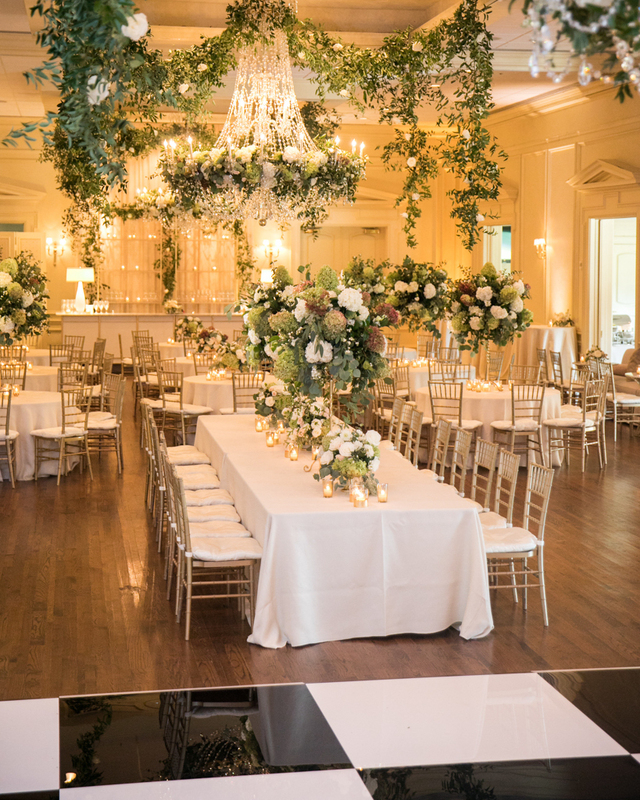 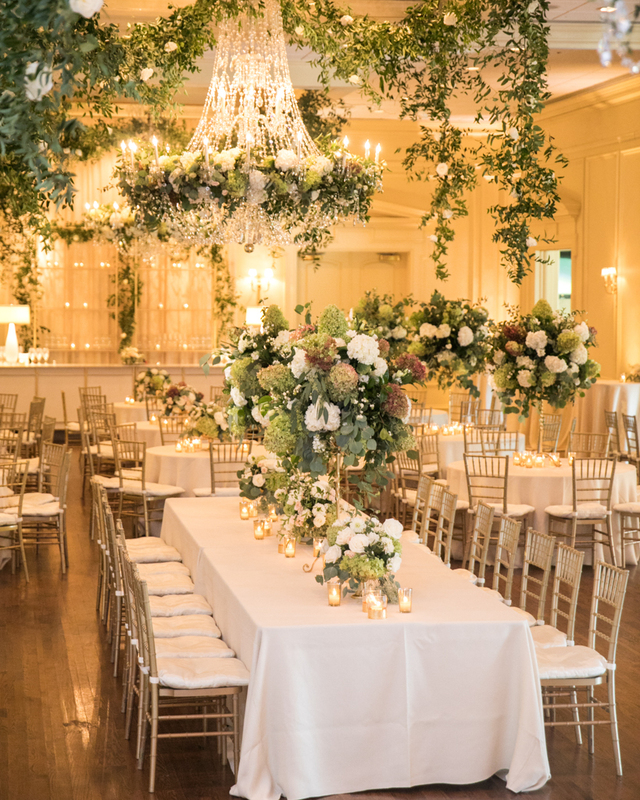 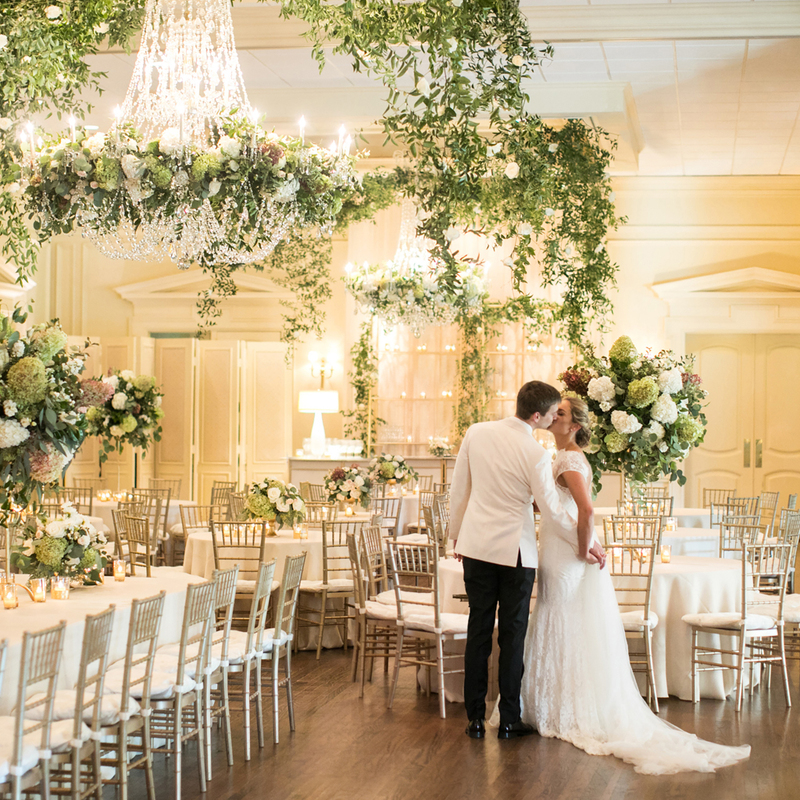 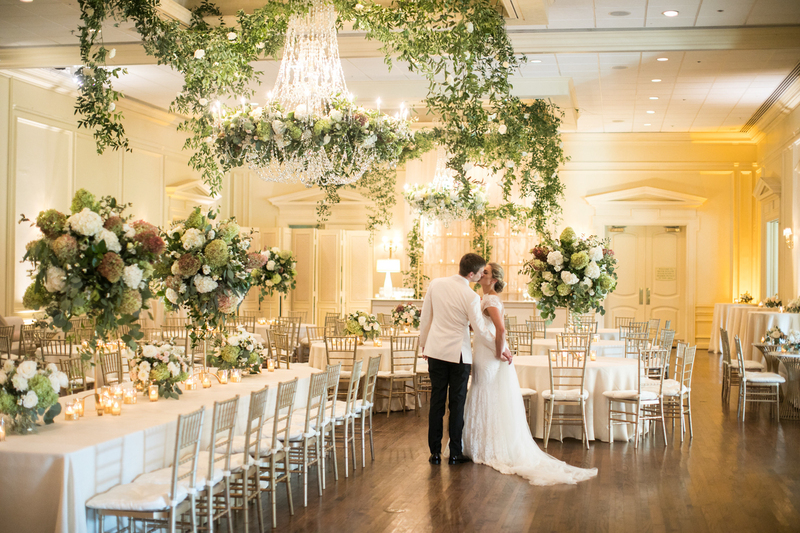 The reception took place in a beautiful ballroom decorated with gorgeous garlands suspended from the ceiling as well as floral-adorned crystal chandeliers. 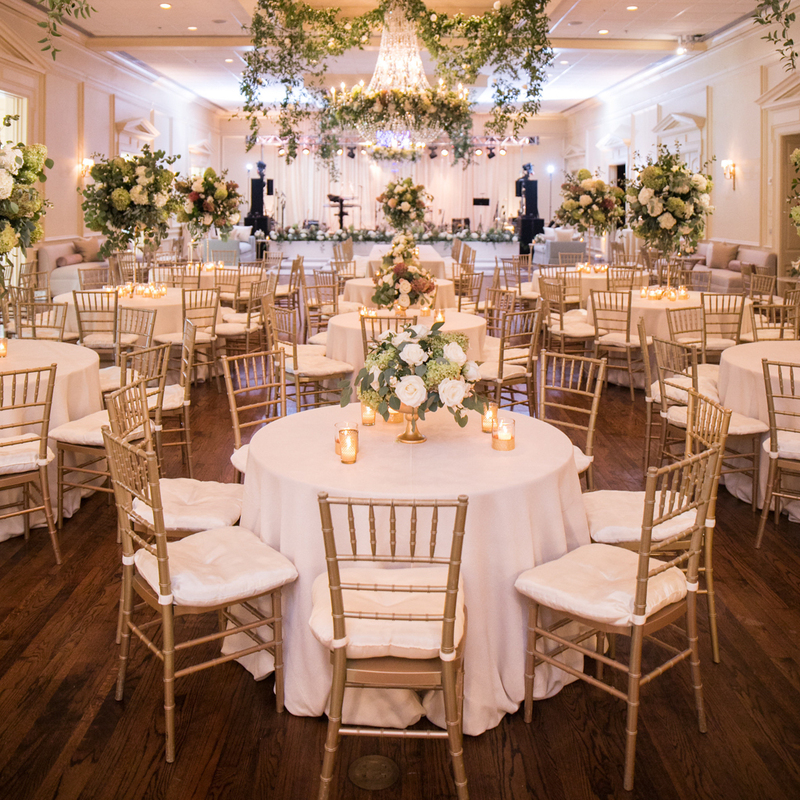 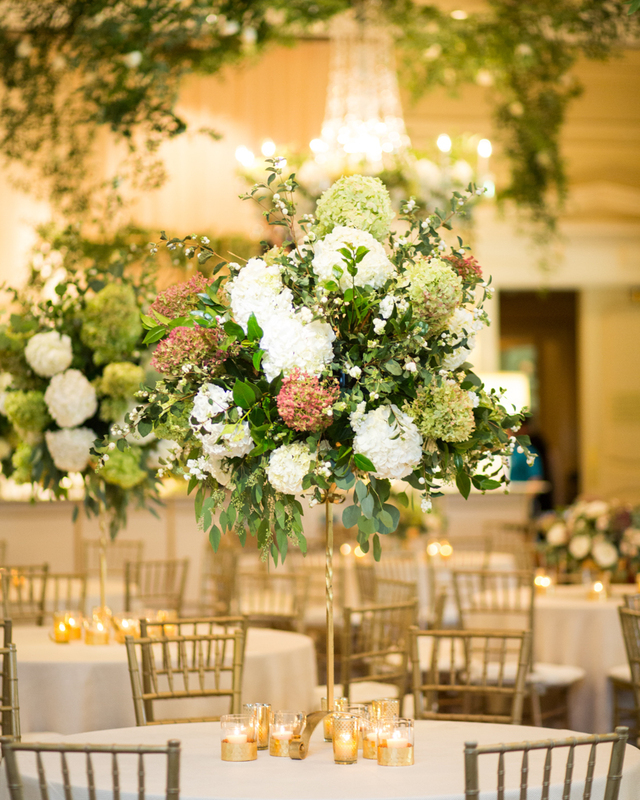 Round and rectangular tables were surrounded by gilt-backed chairs and topped with a mix of high and low arrangements comprised of greenery and billowing blooms in bullion-hued vessels. 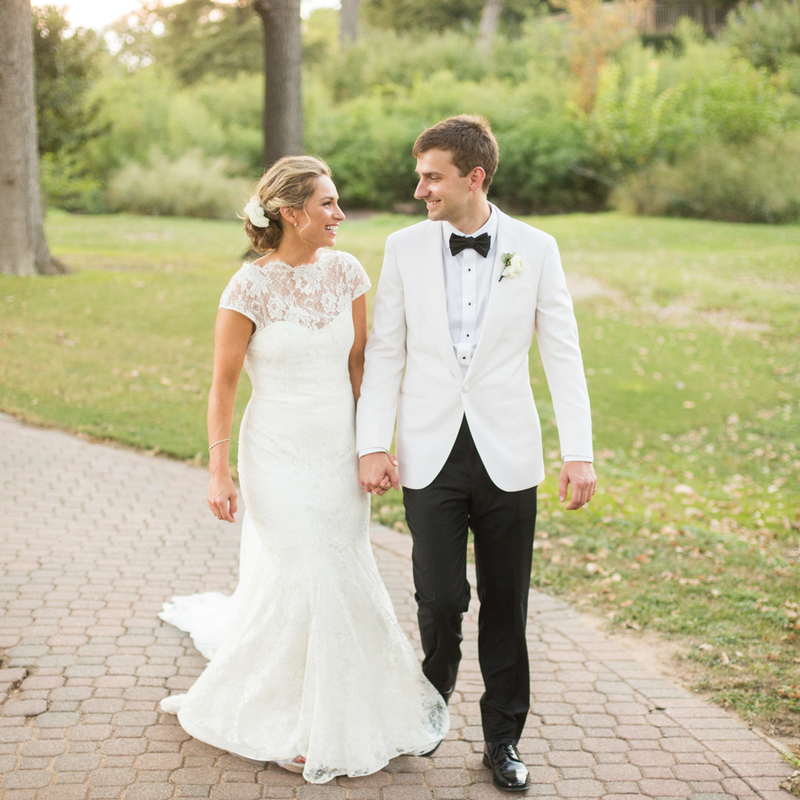 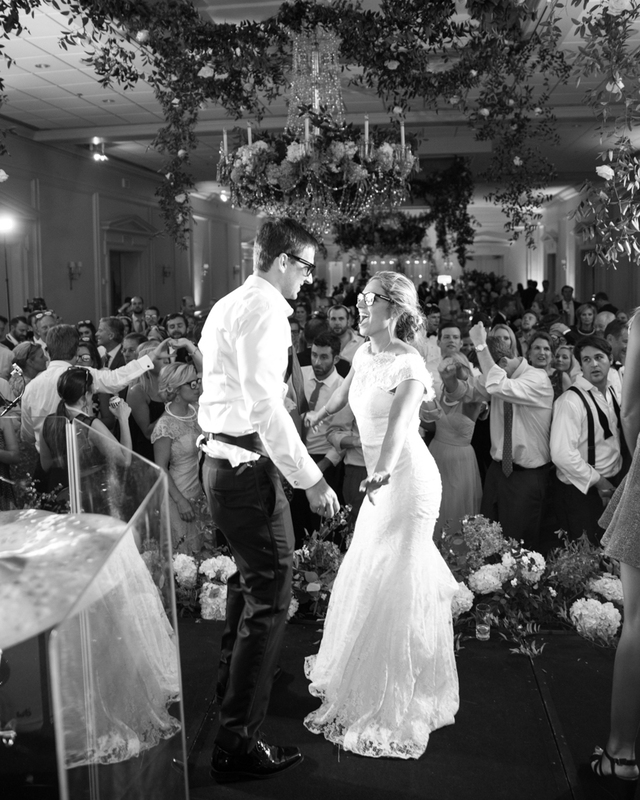 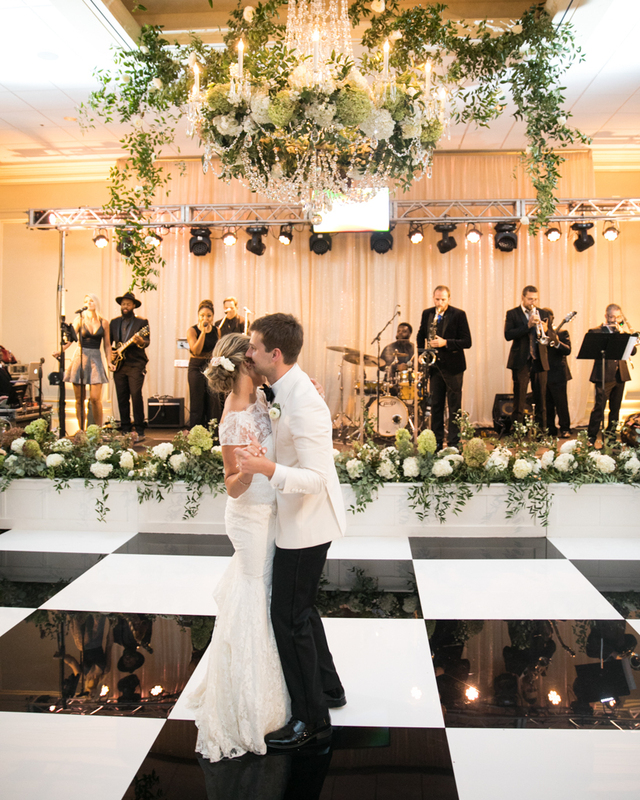 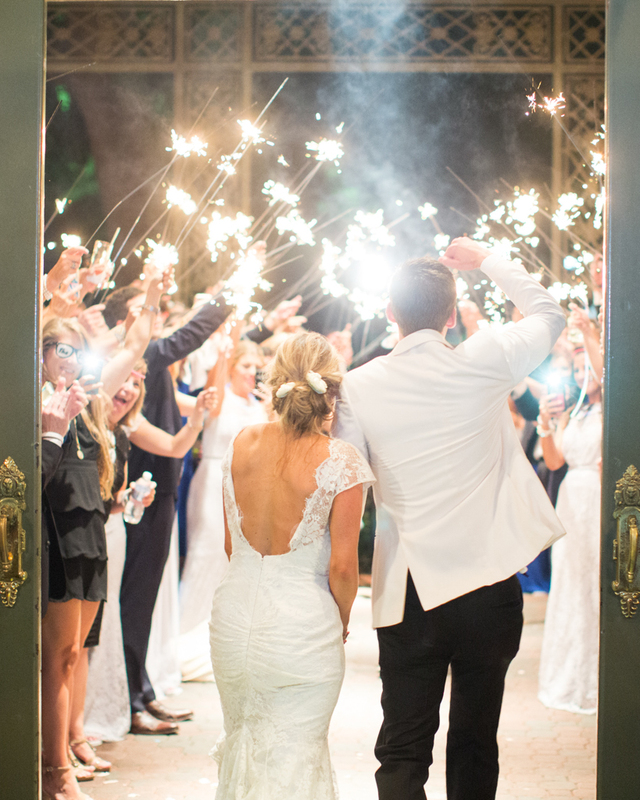 After the newlyweds’ first dance, father-daughter and mother-son dances followed before friends and family flooded the black-and-white checkerboard dance floor for plenty of revelry to the sounds of a live band.